Nine-time winner Rafael Nadal and defending champion Novak Djokovic both won in straight sets to reach the third round at the French Open. Nadal, the fourth seed from Spain, looked at his very best in outclassing Dutchman Robin Haase 6-1 6-4 6-3 in under two hours. 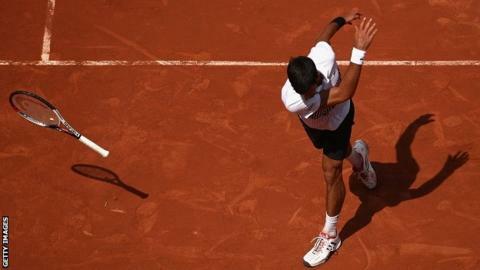 Serbia's Djokovic, the second seed, beat Portugal's Joao Sousa 6-1 6-4 6-3 in two hours and seven minutes. Nadal and Djokovic are seeded to meet in the semi-finals. Djokovic, a 12-time Grand Slam winner, goes on to face Argentine Diego Schwartzman while 14-time Grand Slam champion Nadal takes on Nikoloz Basilashvili of Georgia. Eight-time Grand Slam champion Andre Agassi watched Djokovic once again, having taken over as the 30-year-old's coach on a temporary basis. "I think the first two sets went very well, the third was was more difficult," said Djokovic after beating the world number 59. "Generally, I felt better than the first round, so that's exactly what I wanted." Nadal finished his match with a tally of 33 winners and only 13 unforced errors. "I was more or less under control during the whole match, so I'm very happy. Winning in straight sets is always good news," said Nadal. "I think I did a lot of things well." The 31-year-old is bidding to become the first man to win 10 titles at a single Grand Slam event, having lifted the trophy from 2005-2008 and 2010-2014. His only defeats at Roland Garros were against Robin Soderling in the fourth round in 2009 and Djokovic in the 2015 quarter-finals. Nadal has been in formidable form on clay this year, winning his 10th titles at Monte Carlo and Barcelona as well as his 30th Masters title in Madrid. There are three, maybe four, players that could possibly beat Nadal. Stan Wawrinka is his biggest worry. He has the ability if he is on his game to play the most extraordinary tennis on this surface. Of course you can't discount Novak Djokovic or Andy Murray and then Dominic Thiem who beat Nadal this year. Everyone else are lambs to the slaughter when they go out to play Rafael Nadal.